The Japanese American National Museum, First and Central in Little Tokyo, will host a film screening and a book reading this weekend. • “Eclair: For Our Future, For Children” on Saturday, Nov. 10, at 1 p.m. as part of the Tateuchi Public Program Series. Directed by Akio Kondo; starring Hajime Yoshii, Saori, Ayumi Ishida. In 1943, the dark shadow of war is sneaking up and about to change everything. After losing his parents at a very early age, Akio lives his life in and out of the orphanage and reformatory. He encounters people like Detective Toyama, who saves him from hunger by giving him a sweet pastry, the White Satan at the reformatory, his foster mother Fusano, Tomiko from the cinema, and people from the touring company. Program co-organized by the Japan Foundation and sponsored by the Tateuchi Foundation. 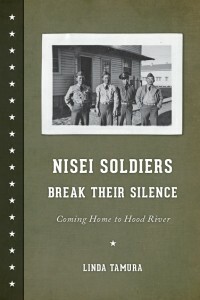 • “Nisei Soldiers Break Their Silence: Coming Home to Hood River” author Linda Tamura on Sunday, Nov. 11, at 2 p.m. as part of the Books & Conversations series. The book is a compelling story of courage, community, endurance, and reparation. It shares the experiences of Japanese Americans who served in the U.S. Army during World War II, fighting on the front lines in Italy and France, serving as linguists in the South Pacific, and working as cooks and medics. The soldiers were from Hood River, Ore., where their families were landowners and fruit growers. Town leaders, including veterans’ groups, attempted to prevent their return after the war and stripped their names from the local war memorial. The racist homecoming reception that the Hood River Nisei soldiers received was decried across the nation. Tamura, who grew up in Hood River and whose father was a veteran, conducted extensive oral histories with the veterans, their families, and members of the community. She had access to hundreds of recently uncovered letters and documents from private files of a local veterans’ group that led the campaign against the Japanese American soldiers. This book, which is available in the Museum Store, also includes the little known story of local Nisei veterans who spent 40 years appealing their convictions for insubordination. It is published by University of Washington Press as part of the Scott and Laurie Oki Series in Asian American Studies.